My blog has taken a rest for a few weeks because my second stand-up comedy class has consumed my attention. This phenomenon reminds me of my mother’s modus operandi. When she was involved in a creative project, everything else came to a halt. A typical undertaking was the script, costume, and props for a gag to entertain people. 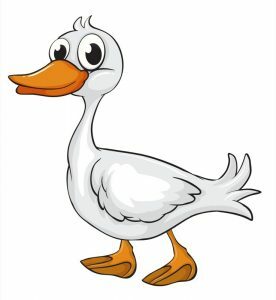 The duck skit is the most recent example that came back to me. Mom used cardboard boxes and paper mache to create a hollow replica duck large enough for an adult volunteer to crouch inside clutching a giant egg, also made of cardboard and paper mache. Each foot for the duck fit over an adult’s shoe and consisted of cardboard for the sole and orange fabric for the upper part. The legs were heavy stockings she dyed to match the feet. For each event, she had to find a volunteer willing to don the stockings and feet and hunch forward in the duck shell. The casing provided limited fresh air. The peephole to help the volunteer see where to go was minuscule. I wore the costume once. That’s how often most people were willing to do it. When the duck skit came up on the program, Mom would get the audience’s attention on stage. As she talked, the “duck” would waddle into view and create a considerable distraction. At centre stage, the creature lowered itself, so the body touched the floor for a moment. When it rose off the floor and waddled off stage, the audience laughed heartily when they saw the egg left behind. Mom put a tremendous amount of work into making the costume, finding events that needed an act, and rehearsing with volunteers. She got so much pleasure from the whole process that no one dared question whether all that effort was justified for five minutes of entertainment. Since my current course started on February 20, I’ve been writing dozens of jokes. Several have made me laugh out loud at home and fell flat in class. I will get five minutes in the Showcase at the end of our course on March 22 to share the few jokes that survive the rigorous editing process. The personal growth this challenge provides makes the whole effort worthwhile in my books. That said, I hope I don’t lay an egg. This entry was posted in Writing on March 14, 2018 by Wilda. Love it! The self-analysis is brilliant! Anyone have use for the duck feet which are still in my closet as a reminder of mom’s shenanigans? I don’t have half the nerve of my mother or sister and have given up all hope of ever using those duck’s feet.